This is unashamedly borrowed from Hugh Fearnley Whittingstall’s superb book The River Cottage Cookbook and is a great way of serving mackerel on a different way – cured, rather than cooked. You will need some home-made equipment: a two litre (or larger) ice-cream carton or similar sized old Tupperware box. and a piece of clean wood cut so it fits snugly inside it. Drill a few small holes (5mm) in the bottom of the box for drainage. 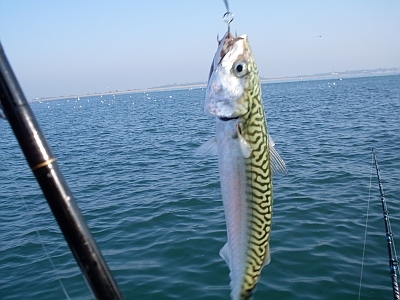 Fillet your mackerel and remove as many bones as possible. Mix the cure ingredients above. Now sprinkle some of the cure in the bottom of the box. Place fillets skin side down in a single layer on the box, and sprinkle more cure over. Place the next layer of fillets skin side up, sprinkle more cure over. Then a layer skin side down, and repeat until your fillets and cure are used up. Put your wood on the top, put the box on a plastic tray or china plate (not metal) and put a weight on top of the wood. A couple of tins of beans will do. You might want to put the tins in a plastic bag so they don’t touch the cure and go nasty. Put the whole assembly in the fridge. Twice a day, take the liquid that has oozed onto the plate and pour it back over the fillets. After three days your Gravad Max is perfect (actually you can start eating after a day but three is better). Mix the first three ingredients until the sugar has dissolved, mix in the creme fraiche, then the dill. Simple, and goes with it perfectly.